J.R.R. Tolkien wrote that “all we have to decide is what to do with the time that is given to us”. For adults this involves reflecting on the time that has already elapsed and deciding what is important enough for us to spend our precious minutes on. Children, on the other hand, live exclusively in the present. For them, elapsed time is as mysterious as the origins of a flower or the morning dew. 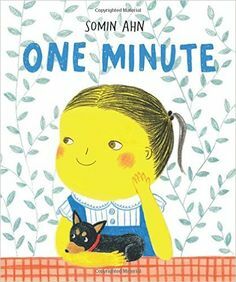 One Minute, a picture book written and illustrated by Korean author Somin Ahn, introduces children to the concept of the passage of time by describing what can happen in one minute. Blink your eye twenty times, grow your hair, and hug your dog are just three of the things a person can do in sixty seconds. The things we do every day without thinking take up the minutes of our days, and weeks, and months, and years. Each example comes with an illustration. Sixty seconds on a clock equals one year, your hair grows 0.00068 centimeters. As a teacher, I love that the book applies the practical experience of the passage of time to concrete experiences. I think that this book would definitely be a great instructional tool for teaching elapsed time as well as being a character lesson for how to best spend the minutes given to you. On a purely constructive level, the book teaches kids to appreciate the time they spend with loved ones. It is not just about how how one should spend one minute, but about how one minute can never be replaced.